Hyaluronic gel filler is a support fluid found naturally in human tissue, which when depleted causes wrinkles. Hyaluronic gel works with the body’s own hyaluronic acid reserves to create volume, smooth lines and folds or fuller lips leading to an anti-ageing effect. Hyaluronic gel fillers, contain no known allergens or animal proteins. This means there is no need for a test dose. Treatment is immediate. They come in the form of a clear gel, which is placed in small amounts into the mid layer of the skin. The gel adds natural volume to those areas where the body’s own hyaluronic acid has been depleted, and smoothes the surface. In most patients facial fillers such these last for 6 to 18 months depending on factors such as skin structure, lifestyle and age. Treatment is quick and simple with spectacular improvement. Results are clearly visible in all patients after just half an hour. 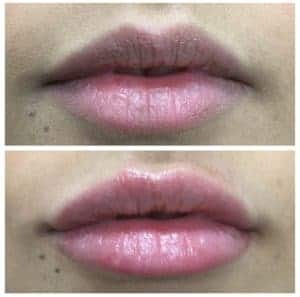 The areas of the face that can be treated with facial fillers are the lips and lip border to create definition or a fuller more voluptuous look if desired, as well as lines around the mouth such as oral commissures, bleeding lipstick lines and naso-labial lines or folds. In the upper part of the face, fillers can be used to treat lines beside the eyes (crows feet) and glabellar (frown lines), as well as cheek augmentation. Hyaluronic gel fillers can now be used for tear troughs. These are the areas under eyes where there is shadowing or dark circles. The filler lifts this area reducing the shadowing and giving a less tired appearance. 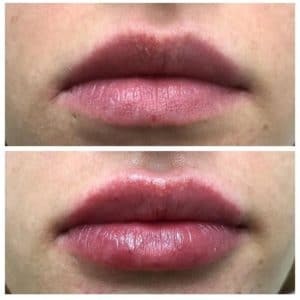 Hyaluronic gel fillers can also be used to firm and strengthen the jawline as well as the marionettes which are the areas down from the corners of your mouth reducing the sour look and giving a more youthful anti-ageing appearance. Acne scars and other depressions can be filled and smoothed. It can even be used to reshape the nose. The augmentation effect of thicker Hyaluronic gel fillers in patients can last two years, but individual results vary. It is an ideal filler for full face rejuvenation and backs of hands. Polyacrylamide more long term gel fillers are a revolutionary product for aesthetic surgery. This unique gel is injected under the skin of the face using a fine needle, where it immediately fulfills its purpose. A simple and gentle alternative to surgery. It can be a fuller mouth, more beautiful and more prominent cheekbones or smoothing a fold at the corner of the mouth. It can be the dream of having a flat nose lifted, perhaps lessen the visibility of an unsightly scar or eradication of an asymmetry due to injury. Polyacrylamide more long term gel filler settles as a soft filler under the skin where it is injected. Immediately after the injection the doctor can manipulate the area so the contours are exactly as they should be. After a short time it feels as if it was a natural part of the skin. The gel however is not absorbed into the skin. This means that the procedure does not need to be repeated after a few months, which is the case with other methods. The gel stays exactly where it has been placed, and this is what makes this filler unique. Aesthetic corrections with Polyacrylamide more long term gel filler need neither hospitalisation nor general anesthetic. In some cases the doctor will use a local anaesthetisation for the area which is to be corrected, but normally this is unnecessary. At first, the corrected area may be a little tender and swollen, but this usually subsides after a day or two. You should be able to return to work immediately, but it is advisable to avoid direct sunlight or extreme cold for the first two or three weeks. An increasingly large amount of patients now opt for Facial Fillers procedures. A very fine needle is used, so that the discomfort of the procedure is minimal. If you’re looking for facial fillers, get a free consultation at Melbourne Facial Fillers clinic with Dr Lanzer. Polyacrylamide more long term filler is a completely transparent gel containing 97.5% water and 2.5% Polyacrylamide – the same material which is used for making soft contact lenses. Dr Lanzer explains that he has used Polyacrylamide more long term filler since 2002 and although it last in the majority of patients he cannot guarantee absolute permanency. Allergy or infection to a more long term filler although rare would be potentially serious. Dr lanzer has not seen this complication. Many doctors refuse to use more long term fillers especially around the mouth due to fear that things may change structurally over the years. Pain may be felt on injection and there may be bruising and swelling. All photographs represent one person’s experience, and results may vary for each patient. The visible change in these photographs has occurred as a result of the procedure/s undertaken, together with a balanced diet and exercise. Dr Lanzer also offers Platelet-Rich Plasma treatments to rejuvenate and slow down the aging process. When you receive the consent form by email, it is important to read through the information very carefully. The consent form contains vital information about your surgery, which includes how the procedure is executed and the risks accompanying the treatment. Therefore, we ask patients only to sign the consent form when they fully understand the procedure. If you have any additional questions about information in the consent form, be sure to contact the Dr Lanzer Clinic. If required, we can provide you with more information via email, telephone, or an additional consultation at the Dr Lanzer Clinic. If you are considering a treatment with dermal facial fillers, you can take advantage of a free private consultation with Dr Lanzer. By visiting our clinic and taking advantage of this free consultation, you can make sure that our clinic is right for you and evaluate if you are comfortable having Dr Lanzer as a surgeon. Requesting a free consultation with Dr Lanzer can be done on the online website form, but patients can also contact our friendly team of receptionists by telephone. Our receptionists aim to provide you with an appointment that suits your busy schedule, so be sure to convey your preferences to our receptionists when you contact our clinic.